New Delhi, Apr 01, 2017 : The price of petrol is cut by Rs 3.77 per litre and that of diesel by Rs 2.91 a litre, the first change in rates in two-and-a-half months. State-owned oil firms cut rates with effect from midnight tonight. Petrol currently costs Rs 71.14 a litre in Delhi and Diesel is priced at Rs 59.02 per litre. 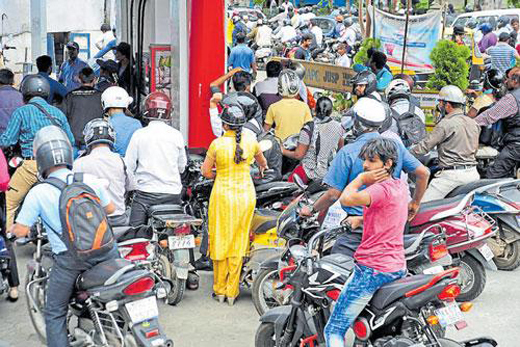 Petrol price will be cut by Rs 3.77 per litre, excluding state levies, said Indian Oil Corp (IOC). Actual decrease will be larger after taking into account the local levies. Similarly, diesel rate was cut by Rs 2.91, excluding state levies. Rates were last revised on January 16 when price of petrol went up by 54 paise. On that date, diesel rates were hiked by Rs 1.20 a litre. Th price of the petroleum product will have en effect on the market on the whole .